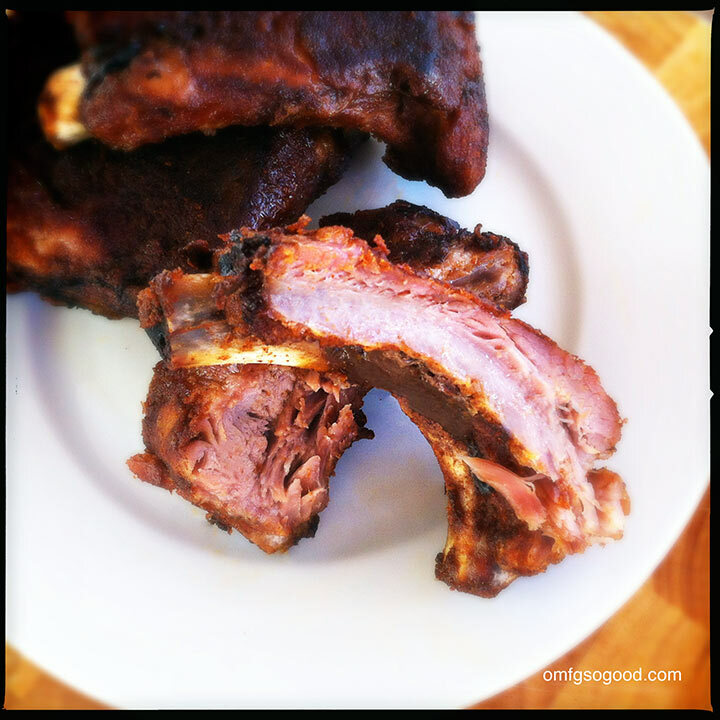 dry rub pork ribs | omfg. so good. Every year, at the start of summer, I challenge my friend Darren to a rib cook-off. With Ribfest 2013 quickly approaching, I figure it’s high time to get my rear in gear fine-tuning the perfect dry rub recipe. I mean, especially since I’ve wiped the floor with his sorry buttocks for the last four years. My people are expecting greatness, and I rarely let them down. Ribfest 2011: Polynesian Spareribs. White flag raised after one bite. Ribfest 2012: White Wine and Honey Braised Ribs. Hell, I’m not even sure he tried them before giving up. The smell alone was enough to bring home the gold. I know, I know. I’m taking a big chance going the dry rub route. And, because I’ve managed to thoroughly berate poor Darren’s rib-roasting skills in a mere three paragraphs, I’m sure he’s going to show up bearing ribs from the heavens. And if he were here, he’d probably call me a Douche and trip me on my way to the bathroom. 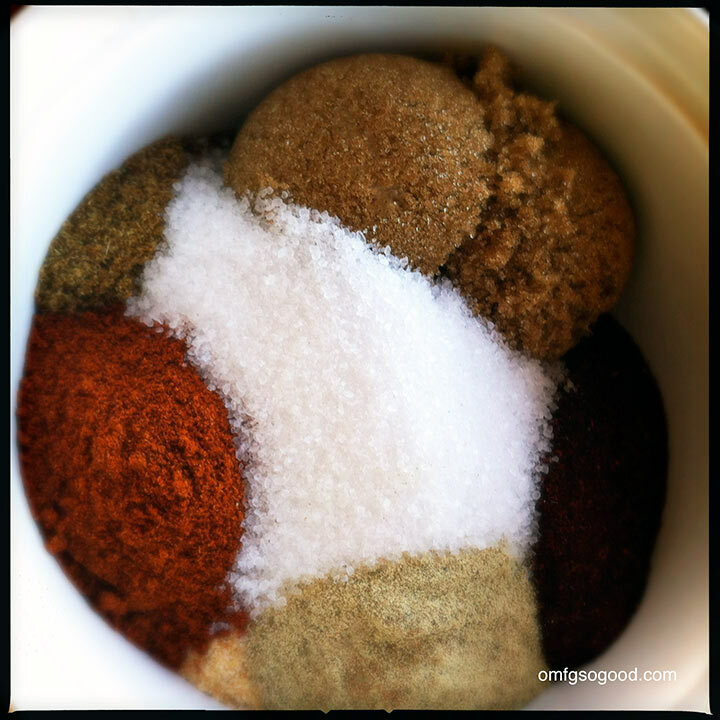 Combine all dry rub ingredients in a small bowl, mix to combine evenly then set aside. 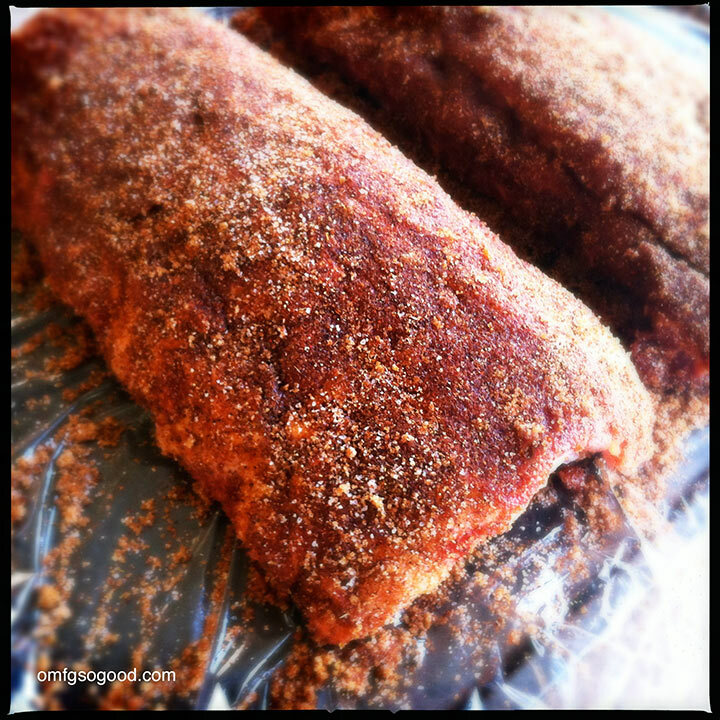 Arrange the cleaned ribs on large sections of plastic wrap on a sheet pan, and sprinkle both sides of the racks with dry rub, gently pressing the dry rub into the meat to evenly coat. 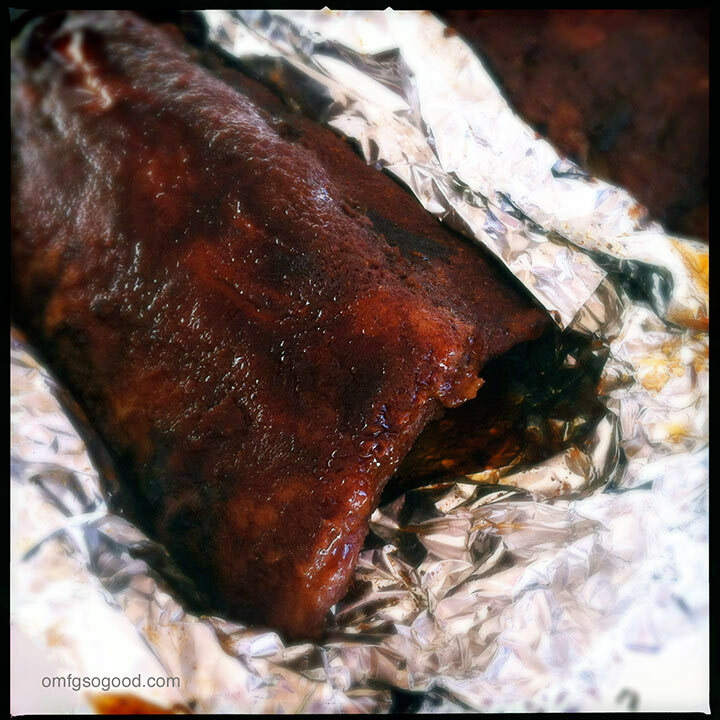 Tightly wrap the plastic wrap around the ribs and refrigerate for 4 – 6 hours (or overnight). To cook the ribs, preheat the oven to 325 degrees, remove the plastic wrap and let the ribs come to room temperature. Wrap each half rack in aluminum foil, add 1 tbsp warm water, then roll the center and both ends of the foil to create a nice little package. Return the rib packs to the sheet pan and roast in the preheated oven for 2 hours. Remove from the oven and allow to rest on the pan for 20 minutes before serving. If you’re feeling really motivated, at this point you can throw them on a preheated grill for 3 minutes on each side to add a tiny bit of ‘crisp’ to the edges. I think I may be on to something with this one. They smelled delightful, and seriously fell right off the bone. I know, everyone says that about their rib recipes. But unlike me, a lot of those people might be embellishing the truth a tiny bit. 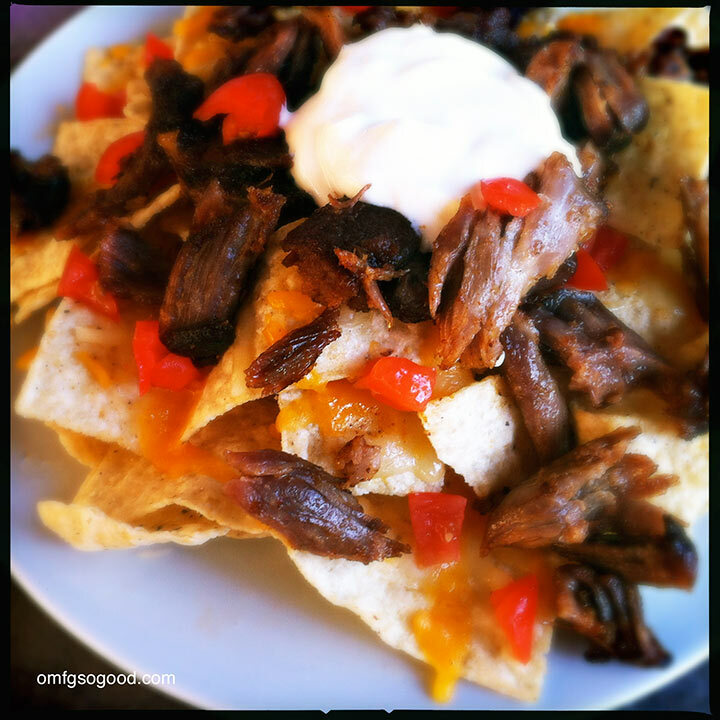 And, because they were so ‘fall-off-the-bone-tender’, the left-overs made perfect Next Day Nachos. Note: These would make a perfect Holiday BBQ recipe. Dry rub them the night before, slow roast them first thing in the morning, and heat up on the grill before serving. Seriously, how easy does that sound?